Sunrise is a light-weight solar telescope created to make spectro-polarimetric observations of the atmosphere of our Sun. The instrumentation consists of a main telescope with an aperture of 1 m, feeding three focalplane instruments: the spectrograph-polarimeter, the filtergraph, and the magnetograph. The focal-plane package is mounted piggy-back on the telescope structure. The central scientific aim of the instrument is to try to understand the structure and dynamics of the magnetic field in the solar atmosphere and the chromosphere as well to understand the physics of irradiance changes. The main telescope has an aperture of 1 m and consists of a parabolic primary mirror with a focal length of 2.5 m and an elliptic secondary mirror thus providing a effective focal length near 25 m. It has a Gregorian configuration, with the primary image formed between the two mirrors. The kind of observations to be done requires a very high spatial resolution down to 0.05 arcsec. and implies a substantial effort to accurately point and guide the telescope. In order to reach this goal, the pointing and guiding system works on two levels, first for solar pointing of gondola/telescope in azimuth by a torque motor drive as part of the momentum transfer unit (MTU) at the gondola support point, and second by precision guiding, and compensation of image motion. 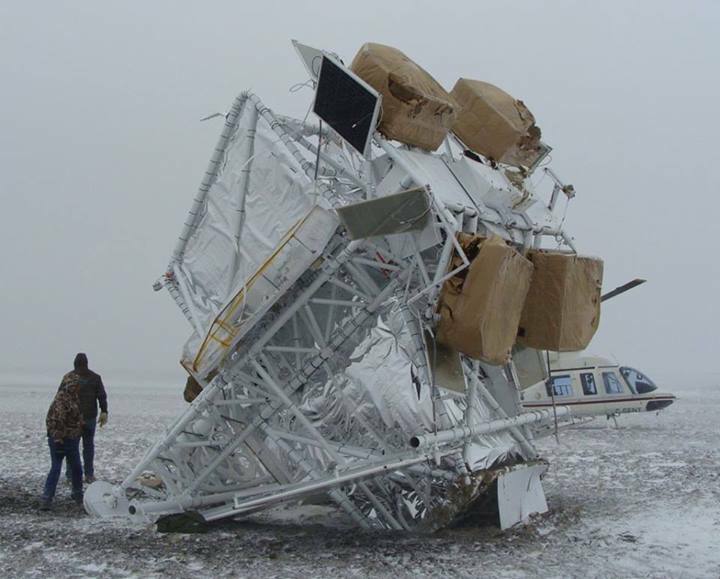 Because of the large temperature differences between ground and flight conditions it is important to have reliable and accurate in-flight alignment capabilities. So a wavefront control system was developed, that is capable of detecting low-order modes of wavefront deformations in the telescope. A wavefront sensor measures the actual state of the optical alignment and generates an appropriate error signal. A control system converts this error signal into actuation signals which are used to drive the position of the secondary mirror, and the tip-tilt mirror. Let's see in detail the three instruments coupled to the telescope. First, the spectrograph-polarimeter (SP) combines high-resolution vector-polarimetry with a multi-line Echelle spectrograph in a modified Littrow configuration, simultaneously providing photospheric magnetic field measurements and diagnostic spectroscopy of photospheric and chromospheric lines. Second, the filtergraph (FG) is realized as a multiwavelength slit-jaw camera of the spectrograph polarimeter. This allows both instruments to receive the full amount of light in all wavelengths. In addition, the image of the spectrograph entrance slit in the filtergrams allows a precise identification of the region simultaneously observed with the SP. Three wavelengths each are chosen to sample the photosphere and the chromosphere. Finally, The Imaging Magnetograph Experiment for Sunrise (IMaX) is an imaging vector magnetograph based upon narrow-band filters. The instrument provides fast-cadence two-dimensional maps of the complete magnetic vector and the line-of-sight velocity with high spatial resolution. IMaX images are taken in two narrow wavelength bands whose selection is made by a tunable system of Fabry-Perot etalons in a telecentric path. In this way, one ensures the homogeneity of the selected wavelength over the field of view. The Sunrise telescope is mounted on the elevation axis to a gondola consisting of standard aluminium components. It is designed to withstand the vertical acceleration that is applied to the attachment rings when the parachute is opened near the termination of the flight. This structure and aeroflex shock absorbers protect the payload from the vertical and horizontal components of the landing shock load in case of landing in cross winds. The gondola can be moved in azimuthal direction to point the telescope and the solar panels towards the Sun. This is realized by means of a momentum transfer unit (MTU) mounted at the top of it, designed to minimize jitter in pointing stability. During ascent, descent, and landing, the telescope is stowed horizontally, so that it is protected by the so called 'cradle'. 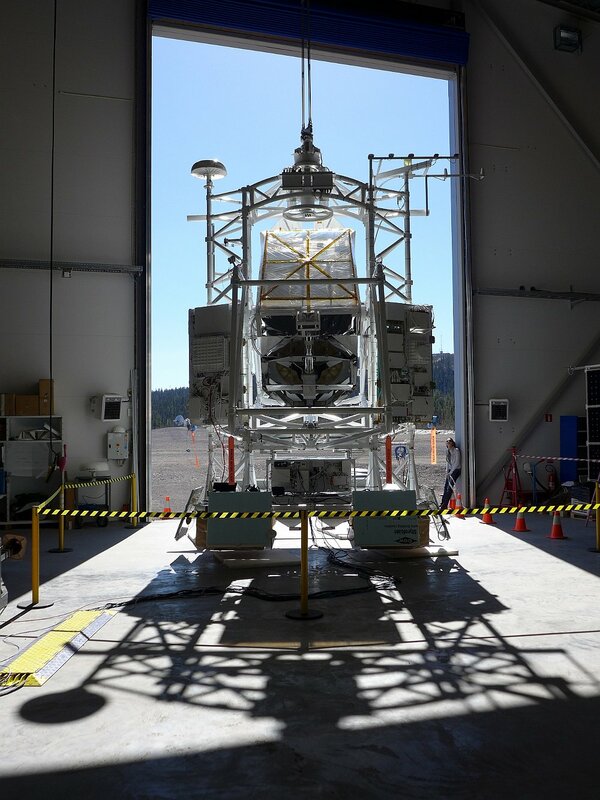 The gondola is suspended from the main telescope frame and rotates with its structure while the telescope is being driven directly via the MTU. 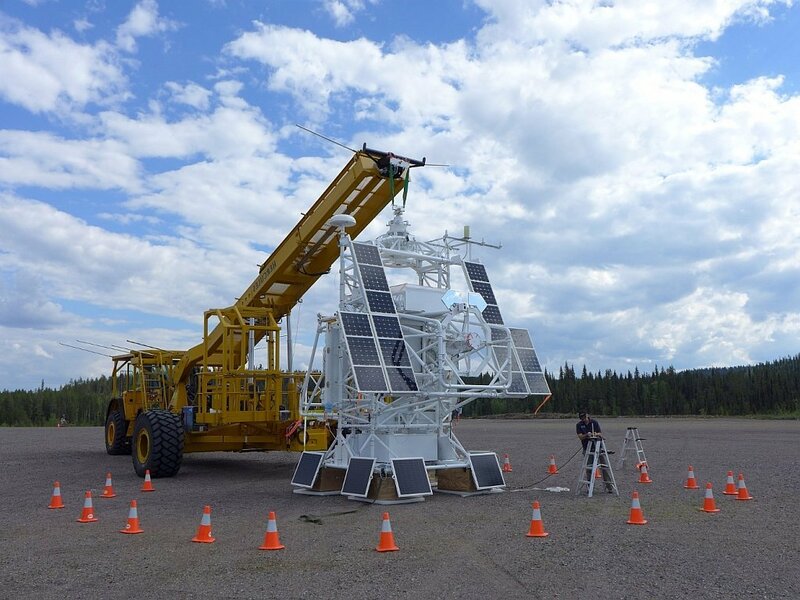 After a first frustrated attempt six days before, the stratospheric balloon was launched by dynamic method with assistance of the "HERCULES" launch vehicle, at 5:40 utc on June 12. After a nominal ascent phase, it was carried out by the westward prevailing winds of the summer and crossed over Sweden and Norway that same day. 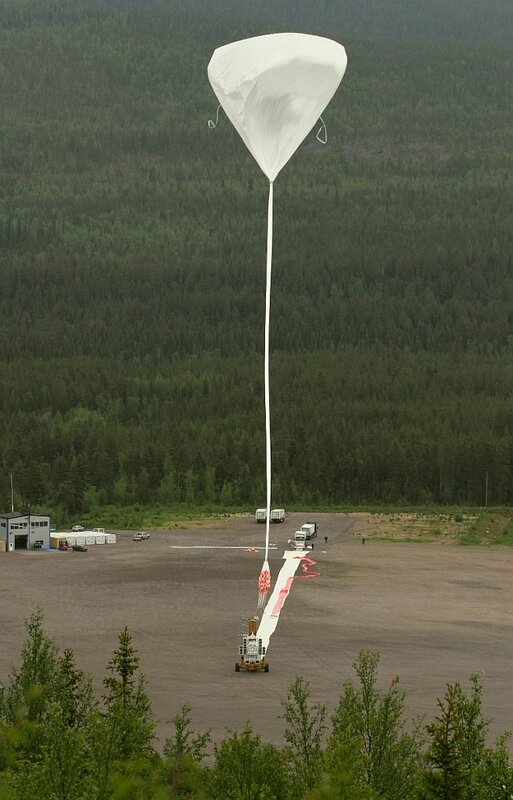 During this first part of the trip a new world record in wireless network connection was achieved as the ethernet based equipment of the Swedish Space Corporation was able to connect with the payload in flight at an speed of 1.8 megabits per second from a distance of 510.89 Km of the base. 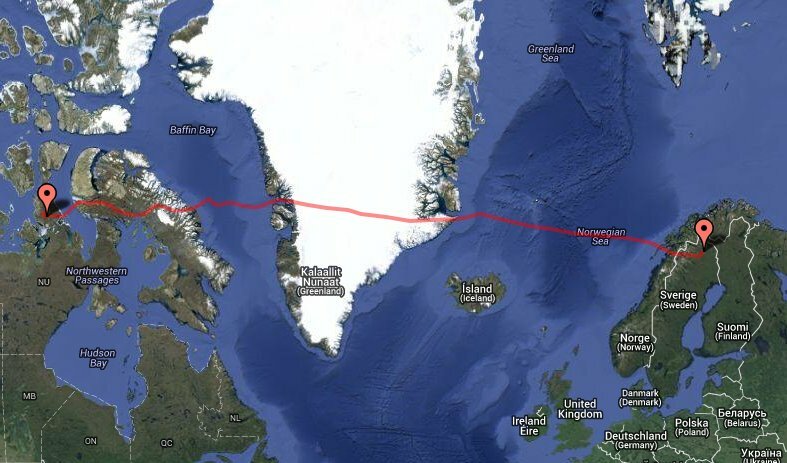 Five days after launched on June 17, SUNRISE finally cleared the Canadian shore just over Baffin Island and after a few hours was separated from the balloon exactly at 11:52 utc. 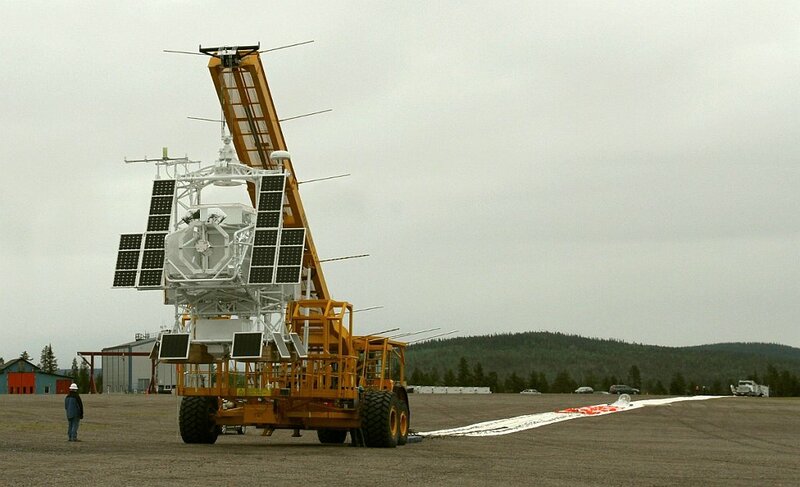 The payload landed 40 minutes later in the central part of the Boothia Peninsula in Nunavut. Mounted in the external frame of the gondola of the SUNRISE telescope, was an experiment named IRIS (Image Recording Instrument for Sunrise) carried out by a spanish group of enthusiasts of science called Asociacion AstroInnova with the sponsorship of Citroen. The experiment was aimed to portray the launch and landing of the telescope with three high-definition cameras in addition to taking photographs and timelapse images throughout the entire Transatlantic flight. One month after the flight, the IRIS team presented to the world the images obtained in the flight, including a time lapse of the entire journey. After a first glance at the images (which below can be seen directly from AstroInnova's youtube channel) we must admit that these are without doubt one of the most beautiful views of the arctic region ever obtained.